Bold, fiery and full of flavour, harissa is one of the best things to come out of north African and Middle Eastern kitchens and into our store cupboards. It has the ability to pep up any dish, and the combination of chilli, garlic and spices brings vibrancy and life to otherwise mundane plates of food. Our collection of harissa recipes showcases the versatility of this beloved spice paste. Add a few spoons into lamb mince and make these Lamb and harissa burgers, or incorporate them into some very tasty Moroccan lamb kebabs. 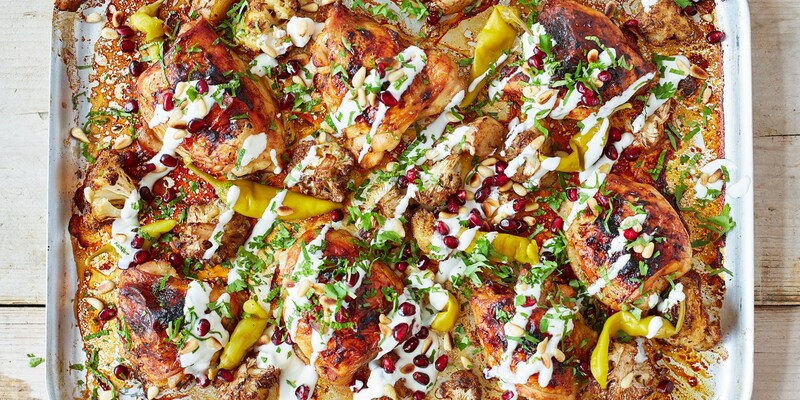 It works as a marinade, too – just take a look at this easy traybake of Harissa-marinated chicken with cauliflower. Give your next pasta dish a hit of flavour with Yotam Ottolenghi’s Pappardelle with rose harissa, black olives and capers, or go high-end with the Galvin brothers’ Tagine of lamb with couscous, preserved lemon and harissa. Making your own harissa is relatively simple, but there are plenty of high-quality ready-made jars of the spice paste available in shops too. Some contain rose, which adds a sweet perfumed note, and they all vary in heat, so try a few until you find the one you like best.